Our Noble Riesling is a golden dessert wine, with aromas of marmalade and straw. It's a rich and sweet wine that is at the same time juicy refreshing. And because it's so concentrated there are actually more grapes that go into this 375ml bottle than would go into a full 750ml of dry Riesling! We've been making a dry Riesling for Angels since 2011, however there are also vines of Riesling that grow alongside ours that have been making trophy winning stickies for years. 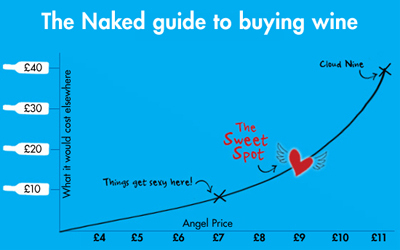 With Naked Wines backing us all the way, we knew we could take the risk. Sticky winemaking is a very risky venture - you need just the right conditions to allow the 'good' (or 'noble') form of botrytis to develop on, but not overpower, the grapes. Fortunately the weather gods smiled upon us with perfect weather, so the winemaking was a cinch and the wine is looking great. Brimming with ripe pear, peach and lemon and braced by a refreshingly steely acidity. This citrusy little number would be the perfect addition to any fish dish.